This committee of alumni works to support the college’s sexual assault prevention and response efforts and to share its understanding of these issues with the wider alumni community. “This work is some of our most important,” says President Adam Falk of Williams’ efforts to prevent and respond to campus sexual violence. To commemorate National Sexual Assault Awareness Month, the college has produced a short video expressing the spirit of our prevention and response work. The committee provides here a framework for discussing sexual assault prevention and response. 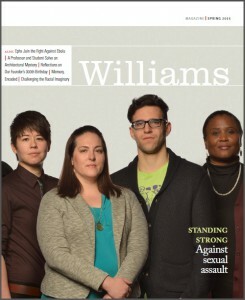 Williams offers extensive prevention and response resources to members of the college community. Visit our resources page for links to the relevant sites.